The ESA (European Space Agency) has posted a satelite image of Vatnajökull when the Holuhraun eruption had just begun as their weekly image of Earth from space. The Icelandic Parliament yesterday accepted a proposal to look into Iceland signing up for the ESA. The ESA publishes a photo of Earth from space every Friday. 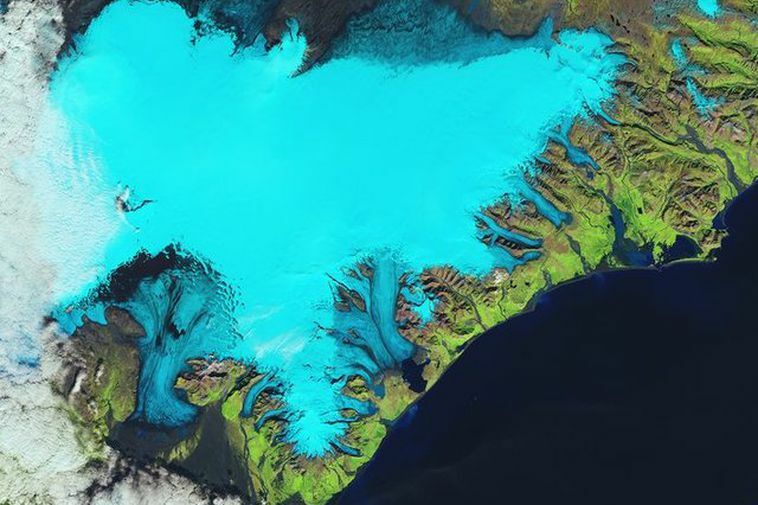 Today's photograph is taken by the Landsat-8 satellite and is a false colour image taken over Iceland’s southeastern coast and the Vatnajökull glacier from 6 September 2014. The caption with the photograph states that glaciers cover 11% of Iceland’s landscape, the largest being the Vatnajökull glacier which at 8000 sq km is also the largest in Europe. "A number of volcanoes lie underneath this ice cap, including the infamous Grímsvötn, which caused disruption of northern European air traffic in recent years following eruptions and the spread of ash plumes. This volcano is visible as a black arc on the central-left side of the image." The ESA was set up in 1975. According to its website, its mission is to “shape the development of Europe’s space capability and ensure that investment in space continues to deliver benefits to the citizens of Europe and the world”.